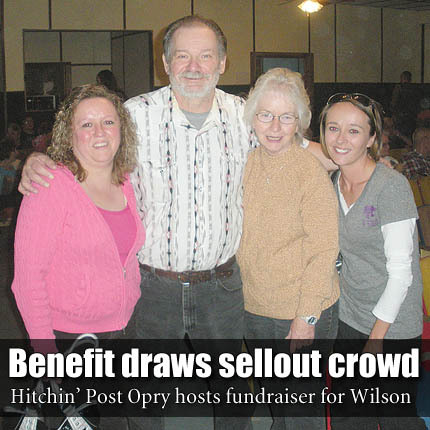 A larger than expected turnout was at the Quenemo Hitchin’ Post Opry on Saturday night to benefit Gary Wilson, a custodian at West Franklin schools and Garfield Elementary School, Ottawa, who is battling Lou Gehrig’s disease. J.R. and Janie Wilson, owners of the Quenemo Hitchin’ Post Opry, donated the proceeds from Oct. 20 toward his brother’s medical bills. The evening started with a dinner set up in a make shift cafeteria so attendees could buy sandwiches before the show began. Individuals donated pies for sale and a donation can was set out for donations. The Hitchin’ Post Opry band played to a sold out crowd. Performers included Rick McClintic, Noel Young, Russell Wolf, Jody Jackson, Rex Douglas, J.D. Weers and Rick Robinson. Gary and wife, Sherri Wilson, and daughter, Dawn Wilson-Brown, Overland Park, were unable to attend due to Gary’s health issues. Gary’s daughters, Veronica Huffman, Edgerton, and Brandi Weidner, Ottawa, were present at the event. Donations may be sent to Ralph Wilson, 3600 Colorado Road, Pomona, KS 66076 care of Gary Wilson Fund.